What are the Benefits of Vinyl Fence? Do you want a fence that will last for many years and require little maintenance? Then you want a vinyl fence! 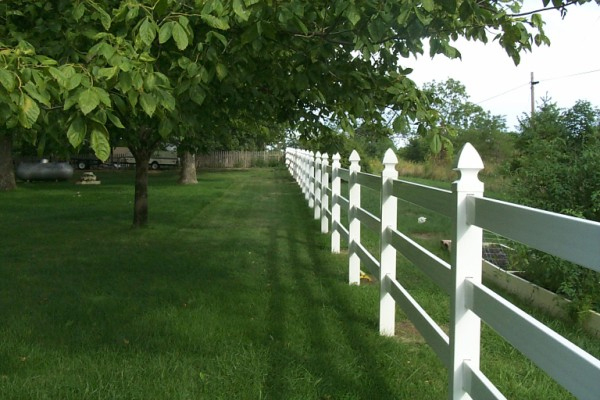 While many fences will last for a long time, they usually require a fair amount of upkeep. Vinyl fences on the other hand require minimal maintenance to keep looking their best year after year. In this week’s blog, we’ll talk about the benefits of vinyl fence, and why you should choose vinyl for your next fence. Other fences such as wood require work like sealing, staining, and painting every few years to keep them from looking worn down. Vinyl never needs to be painted, and uses UV inhibitors to resist fading caused by the sun’s UV rays. When you get a vinyl fence, you can be confident that it will hold its color for many years, with no work on your part. If you don’t take care of wood, it rots. If you don’t take care of your iron fence, it can rust or corrode. Vinyl does not absorb moisture, so it will never rot, rust, or corrode. It also won’t warp due to expansion and contraction, which can take their toll on wood. PTV fence are produced through a co-extrusion process to promote rigidity and strength, which means you’ll never have to worry about your fence deteriorating due to the weather. Vinyl fence comes in tons of different colors and configurations, so you can get exactly the look you’re going for. Vinyl can even be used to imitate wood fence very well, so you can get that classic wood look with all the durability and weather-resistance of vinyl! Because it’s so versatile and customizable, vinyl can have all the aesthetic appeal of other fencing materials. Whether you want the classic white picket fence or a 3-board ranch rail, vinyl will look beautiful in any situation. This entry was posted on Thursday, April 23rd, 2015 at 4:05 pm. Both comments and pings are currently closed.